Combining TaskPaper with 'Tyme' (for time session tracking)? Is anyone using a scripted (or other) solution for time-tracking with their TaskPaper projects ? I notice that Tyme is scriptable, allowing you to attach one or more timeSessions to each task of a project (and yielding project time summations, with time*hourly_rate, and proportional time allocation stats for billing and overview etc). 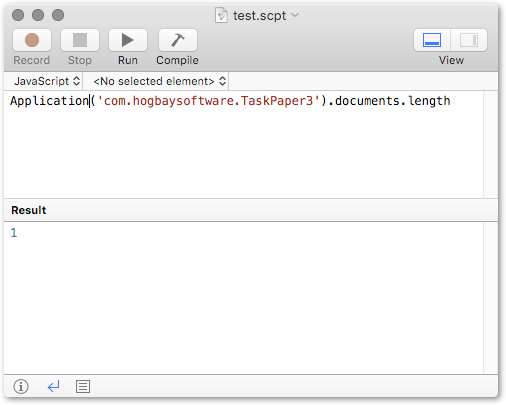 It looks like it might work fairly well as a scripted time-tracking adjunct to working through projects in TaskPaper. I am planning to draft and test an experimental script or two, but do let me know if you are already using some kind of time-tracking workflow with TaskPaper, and have any ideas of which parts might most usefully be automated from TP using Tyme or some other similar tool. I’m not, but looks like a nice project. Way back in the day I had something setup with TicToc, but they’ve discontinued that and I no longer had a need for continuous and rigorous time tracking. Time however does look interesting and I’ve been keeping an eye on the apps. //    strAccountTag and strRefTag arguments in the last line of the script. //    the toggling of time-tracking for the selected task. //		If the selected task is being tracked, tracking stops. //			b) tracking of this task begins. // value of any instanceof this tag on this node or its path ? // project containing selection ? // project and task strings ? Tyme.app allows filtering of time-tracking stats by project tags or task tags. This script assumes that any TaskPaper project will relate to just one account/client and just one invoicing reference, but if that doesn’t match your workflow, it can be easily adjusted. (To use other tag names for the two levels of project tags (rather than @account() and @ref()), change the values of the strAccountTag and strRefTag arguments in the last line of the script). Have you tested against Taskpaper 3? I’m getting “application isn’t running” when I attempt to execute the script after selecting the task. Yes, this is TaskPaper 3 only. You have Tyme.app installed ? Yes, both apps are open. It is dying on line 157. I also did the change above in case I had some old bits around but it dies at the same point. ok, after getting the same error with the above test script. I completely restarted everything and it finally started working. Not sure if I still had an old version laying around or what but it is functioning now. Planning take a look at Tyme 2 (which has new API) over the weekend. I have tried to adapt the script for Tyme 2, and scripted project creation works in it, but scripted creation of tasks appears to be broken. I’ll give an update if the maker is able to fix or shed some light on that for Tyme 2. Got a very quick and helpful response – not broken – the type constructor just needs an extra parameter now – I’ll do something at the weekend. Here is a first draft of a Tyme 2 version which simply toggles tracking for the item selected in the front document of TaskPaper 3. Would you like to test it ? Tyme 2 allows us to assign categories (clients etc) to projects, but the scripting interface doesn’t seem to give us access to that (yet ?) I would really like to get it to pick up a client tag from TaskPaper 3, and find/create the project in a matching Tyme2 category, but I think that may be out of reach, at least for the moment. Does create a new timed entry for new task under existing project, but for some reason doesn’t show as a new task under that project on the projects view in Tyme. Does show on the Time entries screen and turns up on the Archive screen although not marked as completed. Will carry on testing later and also delete my archive - see what that does. Thanks for checking it !